IN a weird case of suspected witchcraft, a Sakubva family was left shocked after they found the grave in which they had buried their 53-year old relative dug up and left wide-open a day after interment at Dangamvura Cemetery. It is not known whether the coffin or the deceased’s body was tampered with as the relatives only consulted a spiritualist who performed some rituals at the grave before covering it again. 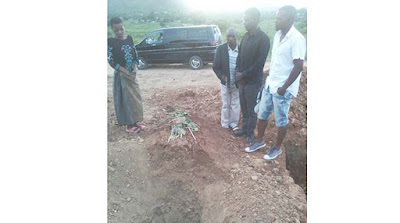 The late Farai Mudukani was laid to rest at Dangamvura Cemetery on Saturday but relatives who visited the grave the next morning to conduct usual traditional rites (Rumuko) got a shocker after discovering that it had been dug up. The Weekender visited the Mudukani family in the Chinyausunzi section of Sakubva and caught up with Richard Mudukani, son to the late Farai. He said they are still in the dark concerning the weird incident. “My father died after a short illness at Mutare Provincial Hospital last Wednesday. We buried him on Friday afternoon at Dangamvura Cemetery. “Before the burial, strange things started happening when we washed his body. He started bleeding through the nose. This is something that we did not expect and we were all surprised. We went on to block the nose bleeding by using cotton wool. “After the burial, we went back to the graveyard the next morning just like our Shona culture demands. Everyone was shocked when we found the grave open. Even another family that had also buried a relative the previous day was also shocked to see our father’s grave wide-open. They advised us not to touch anything and consult a spiritualist first before we cover the grave again,” he said. Richard said his family strongly suspects that it was a case of witchcraft. “Even though we do not know who could have dug up the grave, we strongly believe that this was a case of evil ritual acts. We only managed to consult a spiritualist who went with us to the graveyard and conducted some rituals before he told us that it is now safe to cover up the grave again,” he said. The spiritualist, who resides in the same suburb, refused to comment saying his church regulations do not allow him to do so. “Yes, I assisted the family but unfortunately I am not allowed to talk to the media and appear as if I am advertising my work. You can talk to the family and get their side of the story. As for me I do not want my name and work in the newspaper,” he said. When contacted for comment, Mutare prophet Madzibaba Skynage said such things normally happen when perpetrators want to weaken the spirit of the deceased and deter it from avenging for his or her death. “Some people do it after causing the death of the deceased person and they would not want the deceased person’s spirit to avenge for his or her death. They conduct rituals at the grave and I think this could have been the issue here. Some even go to the extent of taking some body parts for rituals but it is sad to note that in this incident it is not known whether the body was tampered with as well,” said Madzibaba Skynage. Mutare legal practitioner Ashel Mutungura said it is crime to tamper with a grave in Zimbabwe. “There are provisions of the law that deal with protection of the deceased and burial site. It is a crime to tamper with a grave in Zimbabwe and people should know and understand that. In fact, when exhumation is to take place there are well stipulated regulations on application for exhumation. “The law says any person who violates a grave in which human remains are situated, knowing that he or she is doing so or realizing that there is a real risk or possibility that he or she may be doing so, shall be guilty of violating a grave and liable to a fine not exceeding Level Seven or imprisonment for a period not exceeding one year or both,” he said.